For years, we’ve all been waiting for the new Ford Bronco 2020, which, thanks to a certain police chase that took place on June 17, 1994 — we’re looking at you, OJ Simpson — the truck has developed a certain type of cult-like following. With rumors swirling about both the Ford Bronco SUV and Ranger mid-sized pickup truck would, eventually, return to the road, Ford finally did confirm back in January of this year that they’d be producing both automobiles, not just one or the other. Problem was, we didn’t have many details besides that. 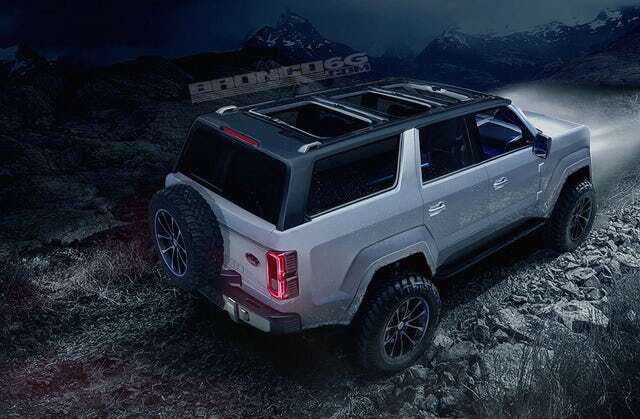 With the Bronco not making its return until 2020 — yes, a whole three years from now — speculation about what the design might look like has been rampant, with a number of different concepts and renderings being tossed around the Internet. One of the most trusted sites that has given us an idea, though, is Bronco6G, with these photos becoming the latest buzz for those itching at what the people over at Ford might be doing. As one can see, the pics are badass, making the Ford Bronco 2020 appear more like a vehicle ready to go into a war zone than something you’d be hauling around your kids in. So, yeah, if it looks anything close to this, your badassery will increase tremendously. What we do know about the Ford Bronco, so far, might be limited, but, according to Ford’s Chief Technical Officer Raj Nair, per Road and Track, it will be a unique concept that will be smaller than the Bronco II but bigger than the original Bronco. Again, who knows what the new Ford Bronco 2020 will actually look like — especially when taken into account all the technological advances that could come into the automobile industry in the next couple of years — but with an expected release date of 2019, we should all be excited about what the pictures above reveal.